Domestic and Residential fire sprinklers installations are becoming common place all over the world. These life saving devices are proven to massively increase the chance of surviving a fire in domestic and residential dwellings. If you have not done so already, perhaps it is time you looked into getting an automatic sprinkler system installed in your home or place of residence. Domestic fire sprinklers are used to protect single family homes or apartments. These systems can be installed into the existing structure of the property for a more aesthetic look. The heads can be concealed in the ceiling or side wall mounted. Depending on the water pressure and flow coming into the property, this system can be attached to the existing water main. If there is insufficient pressure and flow then a tank and pump set can be installed in an appropriate location. Residential fire sprinkler systems are used to protect larger residences than that of a domestic system. These include care homes, homes for the elderly and disabled and some houses of multiple occupancies like student accommodation. The majority of these systems require a large tank with a pump attached to produce the pressure and flow needed to supply the sprinkler heads. Sometimes this tank and pump can be installed outside of the main residence building. 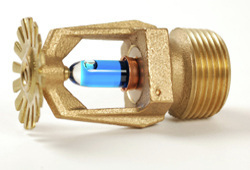 Fire Sprinklers are part of a fire protection system and is connected to a source of water supply at sufficient pressure which feeds to a network of pipe lines. Fire sprinklers are connected to these pipe lines at various strategic locations in the building. Originally installed only in factories, warehouses and offices, fire sprinklers are now available for residential buildings at affordable costs. These sprinklers detect the heat generated when there is a fire in the building and activate the system head which causes the water to be sprinkled over the area thus trying to control the fire. Once the sprinklers come into action, the fire alarm panel connected to the system alerts the fire emergency service. Thus it is easy to see that fire sprinklers do indeed reduce the damage caused by fire, by controlling the intensity before the fire engines arrive. Smoke alarms that are commonly installed in homes, only give a warning about an impending fire, but do not control it when it occurs, whereas fire sprinklers are activated quickly to contain the intensity of fire. Advanced home fire sprinklers are now available in the market. They are designed with sprinkler heads with response timings much faster than that of industrial and commercial sprinklers. Due to the fast acting trigger mechanism, home fire sprinkler systems are activated automatically to bring the fire under control quickly before serious damage is done to life and property. Fires are dangerous and deadly. This is why it should never be taken lightly. It can happen at your own home, in your workplace, a restaurant where you’re having for dinner or at a mall where you’re doing some shopping. This is why fire prevention is necessary. Fire prevention is to spread the knowledge on how to avoid having harmful fires and what to do in case it happens. So many people panic during in these types of situations, which is natural. However, having fire prevention knowledge will teach a person how to move quickly in order to avoid any injuries or even death. There are fire prevention officers that conduct workshops for schools and communities where in they give a lecture on how to avoid and survive a fire. Normally done in schools to teach students, a regular workshop would include firefighters teaching students fire prevention. They will also have fire drills where everyone gets to practice how to evacuate the premises in case of emergency to make sure that everyone is out of a danger zone in a short amount of time. These are normally practiced with students in grade school, middle and high school. But the younger ones are not the only ones who need to be educated about fire prevention. Adults and senior citizens are also targeted because it is not just about evacuating a place but also about different causes of fire and how to avoid them. There are around 3,400 people who are killed each year due to home fires. In fact, eight out of ten cases of fire happen at home. This alarming statistic should be enough to make you stop and think, “Am I safe in my home?” A majority of the fires that happen at home starts in the kitchen. Often, a person starts cooking, leaves the stove on and then gets distracted, only to come back to a big fire. It’s all about using common sense really. Here are some things you need to remember when in the kitchen. · Always be alert. Do not give in to distraction when cooking and regularly keep an eye on what you’re cooking. · Clean the oven regularly. · Get rid of appliances that are not working or have them repaired immediately. Make sure that when you’re not using an electrical kitchen appliance, unplug it from the socket. · Keep things that can burn easily away from the stove or grill. · Do not use metal in the microwave! There should be instructions when you buy this appliance and make sure you follow them. Some cases of fire at home are also due to negligence. It’s easy to avoid accidents if you are smart about things. You don’t want yourself or any of your family members to be in danger so follow these tips to prevent home fires. Install a smoke detector inside your house. If you already have one, make sure that it is working properly. If it is more than 10 years old, it needs to be replaced. Smoke alarms are not expensive so there is no excuse to skip this. Install one on each floor of the house. If you can afford it, install a home sprinkler system. It can be connected to your plumbing system and will immediately work to stop a fire or at least lower the temperature of the room. When using candles, make sure that you blow them out before going to bed. Do not place lighted candles near anything flammable like curtains or bed sheets. Place candles in a proper and stable candleholder. Do not plug in too many appliances all at once. Overloading circuits is a common cause of fire. When something is not in use, take a second to unplug it. Sometimes laziness will be the cause of a potentially dangerous home fire. Keep matches, lighters and other objects that can cause fire away from children’s reach. They do not know better and you do. There should be a plan of escape when a fire happens. Prioritize children and older people when planning an escape. Stay low on the floor when escaping and keep eyes open to see which way is the safest to take. Fires that take place inside a building are sometimes harder to handle because more lives are at stake. It’s more than just knowing where the fire escape is, though that certainly should be on top of your list. Here are some more friendly reminders to prevent fire for people at their workplace. An office normally has a lot more equipment at use all at the same. Computers, printers, photocopy machines, fax machine etc. As you can imagine, this can result in faulty electrical wiring. If there are some equipment that have malfunctioned, do not attempt to repair it if you do not have enough knowledge doing so. Leave it to the professionals. Take cigarette breaks on designated areas only. Buildings normally have smoking areas so be sure to do it there. The next best option is to smoke outside of the building. Always keep your office clean. Get rid of clutter, especially papers, as these are the ones that can easily catch fire. Have at least one or two people in the office learn how to properly use a fire extinguisher. It is there for a reason, and that is to save people’s lives. In case of fire, alert people by pressing the fire alarm. Think of the others who are also inside the building . Exiting the building should be done in an orderly manner. Pushing each other will only cause more injury. Fires are something that no one wants to ever experience. It can lead to serious injury, death and loss of money. Sure, accidents happen but accidents can also be prevented. Fire prevention is important because you need to know how to protect yourself and the people around you. You owe it to yourself if you value your life to know how to save yourself. Fire Sprinklers, residential fire sprinklers, domestic fire sprinklers, fire safety, fire prevention, fire protection, fire suppression, fire sprinkler systems.